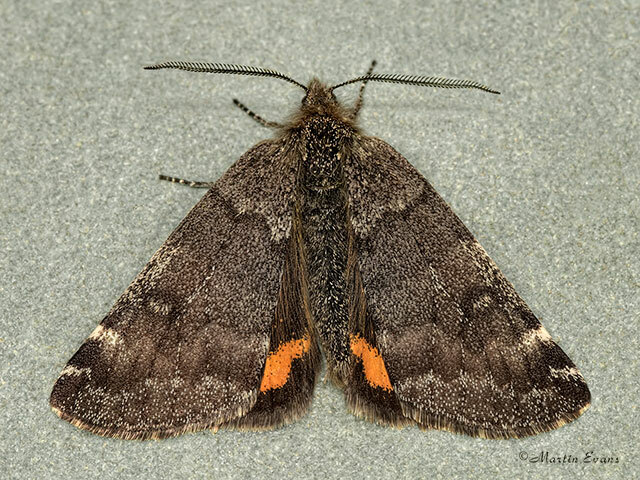 In early April 2018 Roger and I visited a woodland in South Gloucestershire where we had previously recorded Light Orange Underwing Boudinotiana notha. As we expected we saw a few flying above the Aspen (its foodplant ) during periods of sunshine. When we photographed the similar Orange Underwing Archiearis parthenias on the Somerset Levels we found that it was flying high above the birches in periods of sunshine, but came down to the ground in the late afternoon. This was not the same for Light Orange Underwing as they were still flying high in the late afternoon. Despite two visits in March 2019 we still never saw them anywhere near the ground. Then I noticed that where I had seen one on the ground many years ago was actually in shade at that time of day, so it must have been nearer mid-day that it had been on the ground on what is a muddy slope. During a third visit we arrived at about 12.15 pm. Almost immediately we saw what looked like a small brown butterfly flying about twenty centimetres above the ground down a sunny, but muddy path. On closer investigation it was identified as a Light Orange Underwing that had landed on some brambles. This moth soon disappeared (vertically). Another half an hour of walking up and down all the muddy slopes in the area did not produce another sighting. Then at about 12.45pm I suddenly saw two flying together, then another, and by 1.15pm there were at least eleven moths all flying just a few centimetres above the ground and regularly stopping to sip moisture from the mud. There is Silver Birch as well as Aspen at this site which could have resulted in a misidentification, but the males of Light Orange Underwing can be identified by their slightly feathered antennae, whereas the male Orange Underwing has serrated antennae. The females of both species have simple antennae, but are different in that the females of Orange Underwing are red- brown like the males, while the females of Light Orange Underwing are grey-brown. The moths we saw all appeared to be males and had a forewing length of about 15 to 16mm. The moths were active around the mud for about another hour and then at each count there were less, until there were only about three present by 2.15pm when we left the site.